The Bald Truth Radio Show is back. After a break the Bald Truth Radio show is broadcasting again but due to technical problems is not live at the moment. 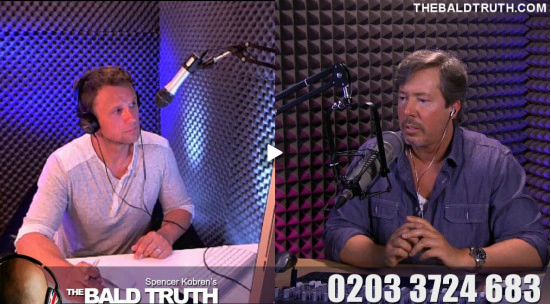 Broadcasting Live from TBT studios in Los Angeles and London, Spencer Kobren’s The Bald Truth UK is the latest offshoot of Kobren’s critically acclaimed, nationally syndicated radio show that has touched the lives of countless U.S. hair loss sufferers for more than 14 years. The UK show attracts over 10,000 views, while the live US show can get 50,000+ viewers! Impressive figures indeed and rising all the time. The show is a no hold barred chat show with many hair loss concerns addressed every week.